The hack worked on a Samsung Galaxy S6. Researchers at Michigan State University in the US have managed to break the fingerprint protection on Samsung and Huawei phones using a standard inkjet printer together with special ink and paper. The process takes less than 15 minutes, the academics say, and it could open the door to hackers wanting to get at the data on your smartphone - provided they can get a copy of your fingerprint, of course. 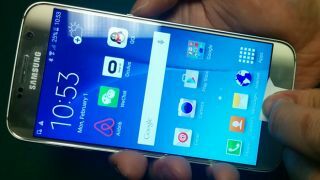 With a high-res fingerprint copy and the special conductive ink and glossy paper used by the researchers, a Samsung Galaxy S6 and Huawei Honor 7 were fooled. An Apple iPhone 5s couldn't be tricked in the same way says the report. While we've seen fingerprint protection technology hacked in the past, previous techniques have relied on 3D printing and special moulds; this new method is a lot quicker and cheaper. The goal of the research is to "raise awareness of the vulnerability of fingerprint authentication and help develop ways to prevent such attacks" according to the team behind the new report. There's no need to panic just yet, especially as handset makers are refining their security procedures all the time, but don't assume the fingerprint unlocking feature built into your phone is necessarily foolproof.